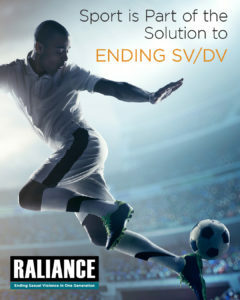 In late 2018, the national partnership Raliance released the Sport + Prevention Center, an online resource on how sport can be part of the solution to prevent sexual and domestic violence. That resource was based on a literature review, interviews with 49 experts, and informed by the insights from previous think tanks convened by Raliance consisting of representatives of sport organizations and of sexual and domestic violence experts. Last week over 20 people gathered for a Think Tank of researchers who explored key research questions that aim to expand the body of evidence for sexual and domestic violence prevention in and through sport, with the goal of developing recommendations to advance these efforts. The meeting was convened by Raliance and the Center for Gender Equity and Health at the University of California San Diego. This Think Tank will lead to a white paper to be released in Spring 2018. Participants at the Researcher Think Tank on Sport and sexual violence prevention.